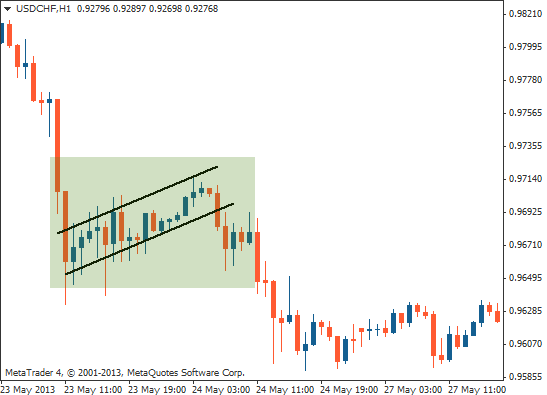 The Flag is a trend continuation pattern that gives you the opportunity to enter the market in the middle of a trend. It occurs when the price of an asset moves up or down in a strong trend that suddenly pauses. The price then trades roughly sideways in a fairly narrow range, often moving gently in the opposite direction to the original trend. Two trend lines marking the top and bottom of that range now give the pattern a sloping, rectangular shape – rather like a flag. The price eventually breaks out of the flag and continues its original strong trend, giving you the chance to enter that trend at a slightly better price than before the flag formed. As with most patterns, there is a bullish and bearish version of the Flag. 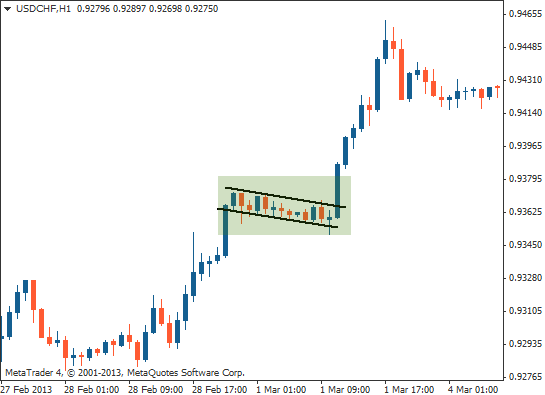 The Flag pattern occurs when a sharply trending price suddenly pauses and retraces slightly in a rectangular range. It then breaks that range and continues in the original direction, giving you the opportunity to enter the second half of a trend at a better price than before the flag formed. As shown above, the price experiences a strong uptrend but then consolidates into a rectangular range that gently slopes downwards. It then breaks out of that range and the uptrend resumes. We will use a bullish Flag in the following example. 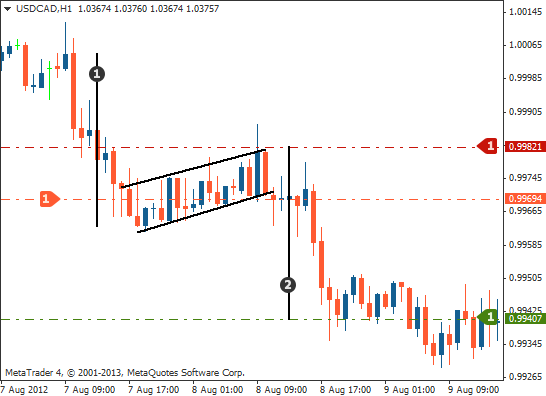 To trade a bearish Flag, simply invert the pattern and your orders. Wait until the price has broken out of the Flag's upper trend line in the direction of the original uptrend. Place a long (buy) entry order once the candle that has broken out of the flag pattern has completed. 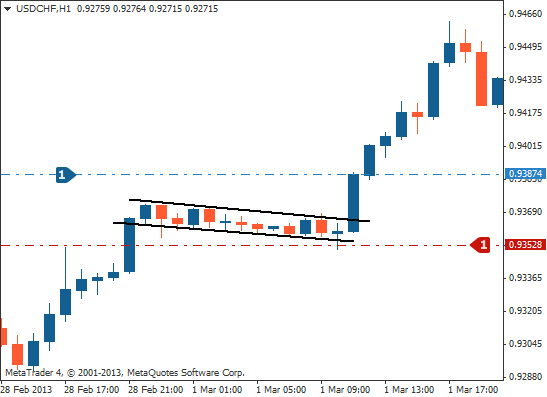 Place your stop loss where the Flag's lower trend line reaches its lowest point. Calculate how far the price rose in its initial uptrend – this is sometimes known as the flag's 'pole'. Then place your profit target the same distance above the point where the Flag's lower trend line ends. … the Flag is a continuation pattern that gives you to the opportunity to enter the market in the middle of a trend after the price has temporarily paused and moved slightly against the original trend. 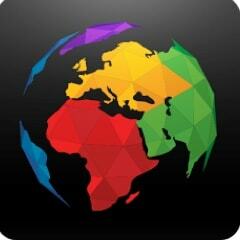 … this means that you can enter the trend at a better price than before the Flag formed. … there is a bullish and a bearish version of the Flag. 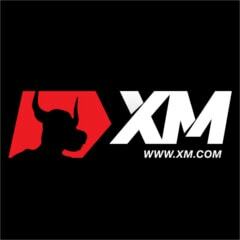 … to trade a bullish flag pattern, wait for the price to break out of the Flag's upper trend line in the direction of the original uptrend and place a long (buy) order here. … place your stop loss at the level where the Flag's lower trend line reaches its lowest point. … calculate how far the price rose in its initial uptrend, then place your profit target the same distance above the level where the Flag's lower trend line ends. … to trade a bearish Flag pattern, simply invert the pattern and your orders.